Ośrodek Działań Artystycznych w Piotrkowie Trybunalskim. Katalog z wystawy "Narodziny Nocnego Motyla" / The Exhibition Catalogue - "The Birth of The Night Butterfly"
Any photographer of dance is charged with a delicate responsibility of translating for the viewer an experience of movement, transient reality, emotional magnetism, and instinctual inspiration. There is always compromise within this realm of photography, given that no efforts can ever convey the experiential impact of a dancer’s physical and energetic expressions. Rather than being an obstacle to still photography, this has in fact inspired several visual artists to interpret the more subtle qualities of Butoh through their respective techniques. Jean Daniel Fricker and Celine Angele in Cambodia © Adam Lach Lunaris. 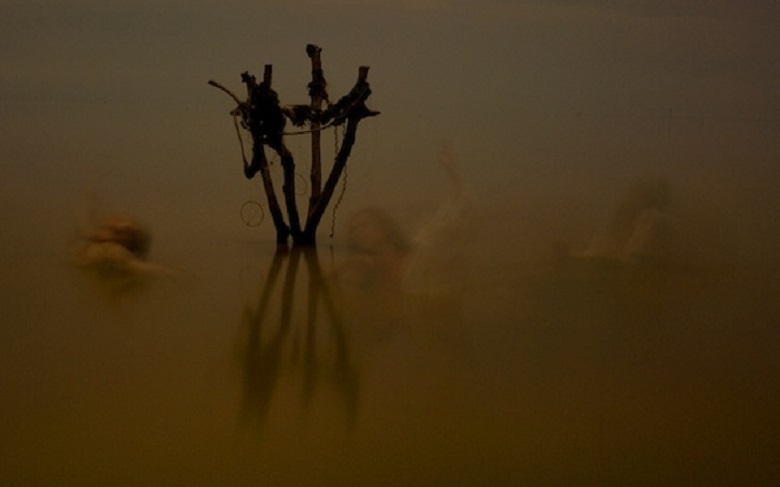 You’ve spoken about your experiences of photographing Butoh dancers traveling in Cambodia. In what is perhaps a more extreme situation of dance photography (minimal communication during the shoot, the intensity of the dance style itself, and the remote, unfamiliar location), how did you find you connected with the dance on an emotional level? Luna-graphy has a certain feature, like a kind of language, which I named “30 second’s exposure”. It is simply the way the camera is writing an image in given light conditions. Movements are saved and transformed into an image depending on the colors of the background and the person moving–white clothes or the naked body give different effects than a dancer dressed in, for example, black. Even dance dynamic plays a major role here. When you have a concept of the final image, you have to know how to move, behave and act in order to get there. This is something I have to present and explain (teach) people in front of my camera. So with Jean Daniel [Fricker] and Celine [Angele], we definitely cooperate on the higher level of emotions. These are very subtle things and they require an unspoken connection, a kind of deeper understanding, which allows for the perfect image to be created. You mention that luna-graphy is a method for you to capture the subconscious or maybe a higher consciousness. How has your technique allowed you to experience that, especially in the case of photographing Butoh dancers? Please stop yourself for 30 seconds. You will realise that many things are going on inside you. Now imagine you are in front of the camera… I feel that luna-graphy conveys the spirit even though on the image, you see the body of a person. This impression is shared by most of the people who view my work. That is how luna-graphy allows me to connect with people on a higher level. What do you feel is the connection between luna-graphy and the philosophy of Butoh? When the full moon started, I introduced [the Butoh dancers] to the concept of luna-graphy. Once we started, we soon realized that Butoh philosophy, with its concept of discovering your inner self during the performance and crossing your inner boundaries, is in perfect harmony with luna-graphy’s long exposure. They work together perfectly, allowing a creation of a unique document captured in one image. A single luna-graphy image is a kind of short movie closed in one photographic image. That is why I don’t think I have simply photographed Butoh. Some could probably call it this way, but personally I feel I was creating luna-graphs portraying dance, movement and performance of Jean Daniel and his group. Jean Daniel himself said that these moon images were something new, something very individual and not yet fully defined. In his opinion, only a few images were purely portraying Butoh.